Before we move ahead, following is quick comparison between Zinus Vs Signature Sleep. Infused with green tea extract, Zinus mattress is anti-bacterial and protects mattress for many years. 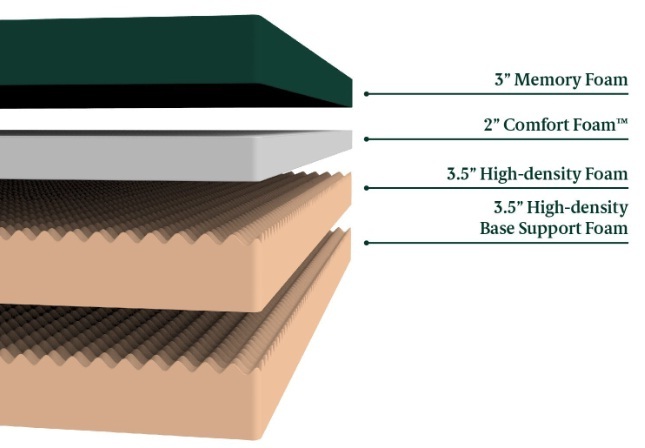 While Signature Sleep carries a simple 2 layer construction, Zinus green tea mattress comes with 4 layer construction. Simple two layer construction is employed for medium firmness, excellent motion isolation plus edge support and above all makes it cost-effective. Even though multi-layer construction, owing to several types of foam employed, is often pricey compared to two layer construction but in this case of Zinus mattresses, the price is low and equal to that of most affordable budget mattresses. Both Signature Sleep and Zinus green tea 12 inch mattresses are not cool gel infused. In case you are looking for some cooling effect as well then opt for a gel topper or rather you can select Zinus 10 inch cool gel green tea mattress. There is a thumb rule when a 2 layered mattress is pitched against a multi-layered mattress. 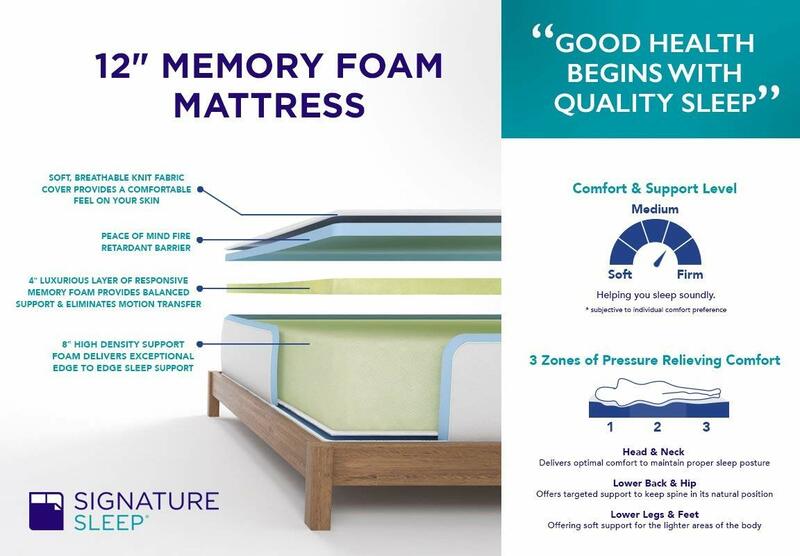 Two layered mattresses always offer better firmness, motion isolation and edge support compared to four layered mattresses. Owing to dual layer construction, the motion impact is restricted to the top 3.5 inch comfort layer and does not transfer to bottom high density layer. Any motion transfer is hence within a radius of 2 to 3 inches at the maximum and doesn’t reach up to your partner. Same is the case with firmness, only the top layer sinks to a maximum of 3 inches even when well built people sleep on it. Edge support is excellent owing to 8.5 inch thick high density layer. Even more, there is no chance that this layer is going to sink or dip even when you sit on the edges. The bottom high density layer will successfully hold your body weight and avoids you from sliding downwards. Out of the total 4 layers, the top 2 are memory foam and comfort layers, together add up to 5 inches in thickness. Hence, body weight is absorbed by these two layers and motion transfer is felt up to 5 inches radius. Although the bottom two layers in Zinus mattress are high density foams, but the top two are again plush in nature. The mattress sinks from 2 inches to 4 inches at the maximum, directly proportional to your body weight. More the weight, greater the sink. Edge support offered by Zinus too is relatively less than Signature when compared. However, it is on par with industry standards offers relatively satisfactory edge support. You will obviously not slide downwards while sleeping on the edges unless you sit on the edges and push yourself downwards intentionally. Signature Sleep mattress clearly scores above Zinus green tea mattress on these critical parameters. However, Zinus has one unique selling point which has skyrocketed its sales and placed Zinus far ahead of its contemporaries, including Signature Sleep. Natural green tea extract infused into memory foam and comfort foam layers offer several benefits. The anti-bacterial properties of green tea protect mattress layers from harmful bacteria build-up which is a common problem with memory foam mattresses owing to sweat and moisture absorption. Both Signature Sleep and Zinus mattresses, although imported from China, are CertiPUR-US certified and conform to US safety regulations. 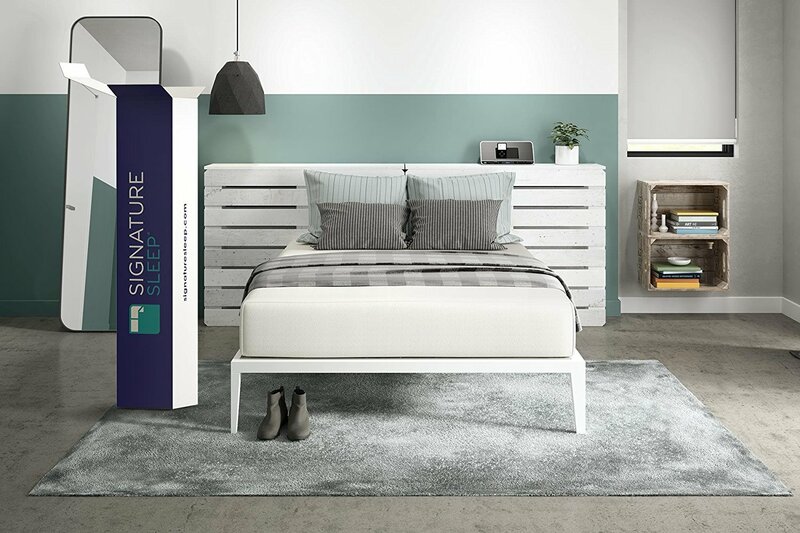 Warranty is another grey area for Signature Sleep as it comes with just 1 Year warranty. Whereas, Zinus green tea mattresses come with standard 10 Year warranty.